“I don;t think you should come. 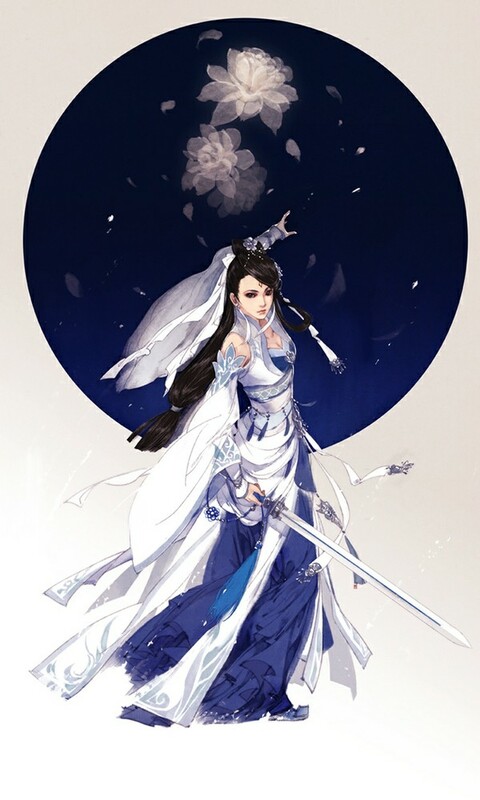 Princess” Zhu Zhan Ye said as they rode out of the city, the moon already high above the skies. At midnight Yu Zhu and Lin Yu arrived, hiding silently in the shadows as they watched Hua Er, Zhu Zhan Ye, and Zhuo Hao walk into view. “Do you have the ledger.” A voice boom and the three looked around. Lin Yu and Yu Zhu too, scanned the area. A boat slide out of the reeds and Doctor Li Sun was tied to the mast. “You had a day. There’s too much in there and the code that it’s written in makes it useless if copied.” The giant guffawed, “But if won’t matter. I was promised that I can kill you, as long as I get you here. Since you are to die from my hands, let me introduce myself. I am Te’Le.” With that he rushed at the three. The man turned quickly and his bear like hand swiped at her. She twisted and barely managed to get out of the way. With a flip she came close to his chest and thrusted her sword in. Like a great bear shaking of a fly, he grabbed her and her sword and flung her off. Yu Zhu landed in the ground with a thud. She rolled and was on her feet again. Zhu Zhan Ye, Hua Er, and Zhuo Hao watched warily as the man staggered. Te’le’s eyes glowed red and he stood up as if Yu Zhu had not just stabbed him through the heart. Yu Zhu cursed and looked at Lin Yu, they had just found a demon. Te’le opened his hands, two foot long, lethal looking claws shot out of his fingers. His arms were covered with fur. Lin Yu came to Yu Zhu’s defense. Her eyes glowed green as she threw her daggers made of her venom at him. Her magic flashed as it sank into Te’le’s body. “I am the son of a Bear.” Te’le laughed gleefully the poison hadn’t even penetrated his fur, “Little snake you must be joking if you think you can take me.” He pounded the earth and rushed at Lin Yu. She dodged the swipes and threw out her sash, the iron like cloth bounding down one of his paws. Yu Zhu and Hua Er both saw the opportunity and they climbed onto Te’le’s back. Zhuo Hao ran up to the other paw and struck it, his sword faster than the eye could see. The Bear roared and fire came from his mouth. Zhuo Hao dodged the fire but did not avoid the paw. He flew across the air and hit a tree. Knocked out. Zhu Zhan Ye saw his brother, he changed course and ran to make sure Zhuo Hao was alright. Hua Er and Yu Zhu battled the bear while on his back, each of them stabbing repeatedy. The other paw came swiping down. Yu Zhu pushed Hua Er out of the way and felt the claw rip into her clothes. She gritted her teeth and sank her sword into the bear’s neck. She fell to the ground as Te’le roared in pain. The wound was painful, but not life threatening. Biting her lip to not scream, she got up again and saw Lin Yu being flung into the lake. The girl crashed into the boat that carried Doctor Li. Lin Yu’s mouth opened, but the screams of the people on shore distracted her. She ripped the cloth from Li Sun’s eyes. He looked at her, his eyes blazing with blue. She back away fear nearly immobilizing her, “You… you are….” What he was, she could see now. Surely she would die once he finished off the bear demon. The blue now spread over his entire body. He rose into the air, his black hair changing into white. “Te’le” A terrible ringing voice seemed to issue out of the Doctor’s entire body. The demon on the shore looked up and roared. A drop of water rose in the air. It bursted into a thousand strings and latched onto the bear. The bear screamed and bit at each one. But every string bitten, ten thousands appeared. The Demon Te’le looked at the lake. His eyes was full of fear. The strings bit deep into his fur, into his skin. It burned icy one moment and hotter than magma the next. Soon it cocooned him into a white, writing mass. The Elemental held out a hand. In it a golden bowl, the kind used by Buddhists when asking for alms appeared. The bear demon was being pulled into the bowl, the characters on the sides of the bowl glowing red until the bear had disappeared completely inside it. Lin Yu stared at the bowl, shaking from head to toe. It was the same one that had captured her aunt. It had broken her family and killed thousands of demons. It was Fa Hai, the famed Demon Killer’s weapon. The Elemental turned to the little snake demon, “Demons are not allowed in this realm.” The bowl began to glow once more and Lin Yu could feel it dragging at her. He raised a hand. But Yu Zhu was jumping across the lake in great leaps using her Qi. “STOP. LI SUN. STOP!” Yu Zhu clutched her sword and swiped at the glowing figure. Li Sun’s white hair and blue eyes unnerved her, but he would have to go through her if he though he could get to Lin Yu. The Elemental looked at Yu Zhu with a shocked expression. “But thats impossible.You’re impossible.” He said as he dodged the blow. Yu Zhu wasn’t listening. She rammed into Li Sun to get him farther from Lin Yu. The Bowl stopped glowing, instead it began trembling, as if the inhabitants in the bowl became restless. The Elemental put a hand over the bowl and began to chant until the bowl began still once again. The two looked at each other without another word. Lin Yu gripped her sword. Yu Zhu stood between them, “Is he human?” she asked Lin Yu. “And in return you become gods. While we are hunted to extinction” Lin Yu said bitterly. The two of them looked at each other with each again, and Yu Zhu knew this would not do. “Goodbye.” Yu Zhu grabbed the other girl’s hand and the two flew back towards the shore. “Are you alright?” Lin Yu asked as she saw Yu Zhu’s bloody back. Yu Zhu looked at the girl with a smile, “Nothing I can’t handle with some rest.” The landed on the shore. The other three people were nowhere to be found. The night hide the dagger from Yu Zhu’s exhausted body and sight. It sang through the air and sank straight in her chest. Even if the wound didn’t kill her, the poison would. She grabbed Hua Er’s arm trying to steady herself. Her other hand still held the cloth mask in place. She staggered in the grass. Lin Yu’s face was full of disbelief as she registered what had happened. Hua Er wanted was burning with anger, “You dare…” But the words were lost as the thief’s hands slipped and Yu Zhu’s mask came off. “Yu Zhu?” The voice was behind her. Zhu Zhan Ye’s mouth fell open. He looked shocked at the appearance of the girl. “What did you call her?” Hua Er’s voice came out strangled. Her ears rang and the earth shook. She took a long look at the girl in front of her. Hua Er couldn’t breathe. The years had melted the child like features and caused the girl’s face to sharpen. But it was still the same eyes, the same nose, the same lips. The voice was no longer so high pitched as Hua Er remembered, but how could she not have recognized it the first time she heard it? The world was breaking apart. Hua Er hadn’t even known why the world was blurring around her. “NO!” She grabbed the antidote from her belt, her hands shaking so much that the little bottle rolled out of her hands, she held onto Yu Zhu and tried to retrieve another one. With that, she felt the last of her strength leave her. She closed her eyes and darkness descended. …oh…my…god. Not you imagined the reunion to go…poor Lin Yu though. She must be so worried and terrified to see Yu Zhu dying. To have to listen to her sworn sister’s wish for her to not hurt Hua er in return… Lol not too worried ‘cuz I trust that you won’t kill off the main character just yet. this definitely causes a whirlwind in the story. Yu Zhu has so far been the center of everything so things really are turned upside down. Thanks for reading I’m def enjoying the comments! Wow. 2 chapters in one day! Thank you dramatictealeaves! (= I sometimes forget how fierce and cold Hua Er could be to take Yu Zhu’s life when she tried so many times to save her during the battle. But she is the notorious midnight thief. Hua Er’s weapon is her poisoned daggers. So sad that they reunite like this. And Yu Zhu will not blame her still. Yu Zhu loves her so much despite everything. I wonder if this incident will either force Yu Zhu’s powers to come faster or Doctor Li will save her somehow. I figured what Doctor Li was when Lin Yu was so frightened of him. All these men around Xu Long Hui are quite unique. I’m sure Doctor Li also knows about that demon in Xu Long Hui and he never did anything about it. I wonder about their story as well. After all, I believe Doctor Li mentioned something about saving him long ago? I’m curious what Doctor Li meant when he reacted to Yu Zhu. Was it because he knew that she was Yu Zhu (in which he thought was dead) or he was able to sense her goddess powers or that he knows of the prophesy? Will Wei Yun show up knowing that she’s in danger? Isn’t the acorn still on her? In alot of ways Hua Er’s guilt just gets piled on higher and higher. And in Yu Zhu’s eyes, Hua Er is the mother she never had. No matter what Hua Er did, I don’t think Yu Zhu could ever stay mad at her. But at her self…that’s a whole different story. For Doctor Li Sun, he’s absolutely extraordinary. And the fact that he revealed this to them, there’s a good reason behind it. Xu Long Hui’s plight is definitely unique, and for those who really like Xu Long Hui and Hua Er, their story is coming to the forefront. And for Lin Yu, I feel so sad for her too. she’s been in this realm so long, told not to use her powers and cares for Yu Zhu loads. Now being told to not touch the one who harmed the one she loves…it’s pretty horrendous. As for Yu Zhu, I don’t want to reveal too much for now. This arc definitely ties up a few loose ends!. Thank you so much for commenting! The direction I chose to go, gave me some worries. Okay, made me worry a lot. But so far the response has been great! Haha I know what you mean. I’m the kind of write that sits down and writes until it feels wrong and then crosses it all out and starts again. It’s time consuming but I think it brings out the best direction to go. In terms of direction, Hua Er and Yu Zhu’s meeting was never meant to be something simple. There’s is a big, complicated relationship and now that the pain compounds its all, Hua Er definitely has to work through a lot of things. And thank you for the compliment. One thing I love about my readers is that the support and comments all come from a kind place. There hasn’t been criticism really, and if there were, it’s all very very constructive and that’s amazing. Thanks! Exactly, Chang’er always point out the things that linger over when reading the story. Mega good job. I feel sorry for Hua Er, she has to be the one to bring harm to the one she loves but I feel more sorry for Lin Yu, her life centers to Yu Zhu, losing her would mean to lose her reason for living and what makes it worse, she is not allowed to bring harm to the person who harmed Yu Zhu. This is a painful chapter. Not to leave out Zhu Zhan Ye, albeit he must be shocked and hurt. So many tragedy happening at the once. Losing Bao Lu, dicovering his brother and Midnight thief’s identity and his relationship with them ans losing Yu Zhu, once Yu Zhu woke up from all of this, they will never be the same. Thanks dramaticleaves for the 2 releases. You’re awesome. Yeah, I do feel bad for Zhu Zhan Ye. Even more so that Yu Zhu totally ignored him since she was all focused on Hua Er. And without Yu Zhu around, Lin Yu will be so lost. After all, all she had was Yu Zhu in the human realm and now that Doctor Li knows that she’s around, that’s even more danger to her. But I’m hoping that this turn of events will also give Lin Yu a “pass” for Doctor Li. After all, Lin Yu isn’t evil and if Doctor Li can allow Xu Long Hui and Shan Ling Yang to roam the human realm, then he should also make an exception for her (regardless of their tribes’ history which seems to be pretty deep). But with Yu Zhu like this, I think Lin Yu would probably stick with Zhuo Hao. Or she might encounter Huang Wu and take care of him. Doctor Li met Xu Long Hui a long long time ago and XLH’s wound is something that Li Sun can not heal. I went back and re-read your comment about Li Sun being a demon catcher. He comes from a pretty fabled line of Demon Catchers and with it comes the rules and responsibilities he can not disobey or it means the disintegration of his powers. This is probably key to his relationship to XLH. As for SYL, there’s a good reason for that too. Doctor Li and Lin Yu has a pretty complicated history, which I will get to more. ZZY, in this stage has a strong crush for Yu Zhu. But no matter how strongly he feels, duty and power comes first. Maybe in the time that comes, it will change… but for now, he has to separate his hurt from his duties. I like what you write about Zhu Zhan Ye. He was the central character for the last few chapters along with Zhuo Hao. And really, the shock of loosing so many people is hell. But the Zhu Zhan Ye I admire was the one who can compartmentalize and strategize. He’s got qualities that definitely make him able to cope, even if the situation looks so impossible! Thank you so much for reading, I love my readers! Julianne is right, not the reunion we were expecting to have. How cruel the fate is. Please please update soon, I can’t handle the cliffhanger. Aww of course! I’ve got a bunch in the works. It’s all drafts. Sometimes they come fast and others slow. I know that this cliffhanger was one of those that I really wanted the reader to feel. I promise I won’t make you wait too long! I didn’t see that coming. So many things happen in the chapter alone. I had to read it several times to make sure i didn’t miss anything. You are awesome as always. Wow! Thank you for that very, very kind compliment! I’m glad that I can keep the story fresh and have it be a good read! Thank you for reading, as always! Yes, one thing I admire about ZZY is how well he compartimentalizes and strategizes and also understands his position. That is why he struggled so much with Zhuo Hao. But I do wonder how he will handle Yu Zhu being the midnight thief and her true identity. It’s kind of hard for him to bring her in as the midnight thief with Hua Er protecting her and her true identity as a royal princess of Dian. Of course, that is a secret, but considering the circumstances, if Yu Zhu does awaken and her identity is revealed, I can hardly see ZZY use force to bring Yu Zhu in for justice (infatuation aside). I’m excited for Hua Er’s and Xu Long Hui’s story coming. With Yu Zhu surfacing, is she going to bring Yu Zhu back to the palace to Xu Long Hui? How will Hua Er make her way back there? I’m looking forward to it. And where is Shan Ying Lang? Hurry and come back! In retrospect, was Doctor Li also using himself as bait to lure the midnight thief out? I mean, with his powers, he probably could’ve taken the giant down when he crashed into the place they lived unless he was waiting for an open and private area to destroy his opponent. The problem with Doctor Li is that he comes from a line of Demon Catchers with a specific set of rules which means he can’t do things unless the demon reveals himself. And SYL’s been pretty good about being human. In this case, I don’t think he knew about the Midnight Thief, or about Lin Yu. His ancestor Fa Hai really set a long list of rules because of what happened between Fa Hai and the White Snake. I might go into that more, I have tons of back story written about them. But it might be a side story. His appearance definitely brings out more questions than answers! Ahaha me too I’m really excited to reveal Hua Er XLH’s story too. Yu Zhu isn’t the little girl anymore, with XLH and Hong Yan Su still battling, it’s almost time to go back. As for Shan Ying Lang, he’s traveling! It took him a while to get there and with a fully human, whose weak and tired, he’s doing his best to come back. I really believe that ZZY and YZ’s relationship will def change after this. They’ve been dancing around each other and they too are about to come head to head with the truth. Loved this chapter. I was going on put my comments but everyone has said what I wanted to ask or the questions I wanted answered. ahahah thanks! You are too funny! Have a good time reading the next chapter! So I went back to reread this chapter and I realized that Yu Zhu really has changed so much. It’s easy to forget about it because we’ve been with her every step of the way while she matured, so to us it felt gradual and subtle. In reality though she’s gone through a dramatic (and definitely understandable, given what she’s been through) shift. In the first chapter she’s such a carefree and happy and mischevious child. It can be hard to reconcile that image with the mature. aloof (only with other people, not Lin Yu), and level headed woman she’s become when you compare them side by side. But the way you’ve written it, it feels so natural, and Yu Zhu’s definitely retained her core characteristics; she’s fiercely protective of those she cares about, she’s kind and doesn’t judge too quickly, and more.